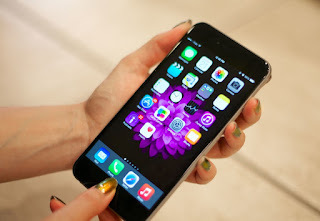 Repair water damaged iPhone is possible. Don't listen to those people tell you it cannot be repaired and need to replace the motherboard. You just haven't found the right person. Our success rate of repair water damaged iPhone is 90%. As long it's not sea water, then it's very high chance to be fully repaired. Data recovery is 99% success rate. This case is an iPhone SE. This device been to many shop. Ended up a lot of missing screws and other damaged on it. Owner needs to recover all the photos in it. Lucky she got some recommendation from her friends, the iPhone SE finally reached into very best hand - me @ my shop. Below video is to show you how i'm going to save it. The differences between me and those amateur. Make sure you turn on subtitle. Why we don't have On-Site repair or Road truck service? Because advanced repair is in our "LAB". Don't ask how much repair water damaged iPhone. We can't give exact price without look on it. We quote you ONE exact price. NOT gonna tell you to pay more later. Some bad dealers done repaired and found out new problem then tell customer to pay. We don't want that. Do you know that Japan and Korea iPhones are unable to silent their camera shutter sound? It even make a shutter noise when you take screenshot with Silent turn ON.. It's been two years until now that i fixed a lot of this problem. Now i reveal the secret of how i done it. There are few used/recond iPhone supplier in Malaysia still sending this kind of iPhones to me for modification. Actually it doesn't consider a problem. Apple just want to prevent iPhone being use to sneak peeking especially in Japan. Maybe it's Japan policy for them selling iPhone there. If you lazy to read article then watch our video in YouTube. That time i knew there is no difference in hardware motherboard between Japan iPhone and ours. So i guessed it is the software causing that. But software iOS firmware that we downloaded are the same file, there is no difference on firmware either. So last thing i suspected is the "Model Code" also known as Area Code in "Setting - General - About". This must be the one telling the iOS to act differently in Camera Mode. As you can see, Model code MG4C2J/A. J/A mean this is Japan iPhone. 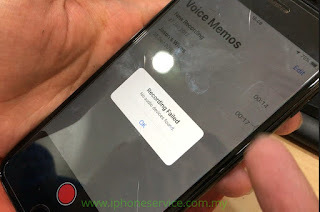 Both Japan and Korea will still make camera shutter sound when the iPhone in Silent Mode or ringer volume set to zero. And the shutter noise is louder than usual iPhone. So all i need to do is reprogram the Model Code into somewhere else. Step 1 - Take out the Memory chip which we called NAND. The red box one is the NAND. Every iPhone must have one. We can upgrade it too. As far until now 2018, Apple didn't make any memory chip. They usually use Toshiba, Hynix and Sandisk. So that's why third party to reprogram those memory is possible. Step 2 - Unsolder the NAND out and we put into NAND writer tool. This is one of NAND writer tool by company WL. Read the original NAND database. See the J/A? Just change this to the country we want. You can check this link to know more country code for iPhone. Step 4 - Solder back the NAND onto the board and it's done. I wrote it to MY (Malaysia). The fix is permanent. It won't affect you to update iOS or restore device. Two years until now.. from iOS 9 until iOS 12. None of them return with problem. We can do for free if your device want to upgrade the storage in our shop. If not then we charge you a labour cost. Battery offer price by Apple will be ENDED at 1st Jan 2019 !! Hurry grab it before they return to normal price which is few hundreds ringgit. RM 125 for all models iPhone. 3 months Warranty. 15-20 Min replace process. On The Spot. We uploaded a video into Youtube about iPhone 7 and 7 Plus Audio IC disease. Consume or drain the battery fast? 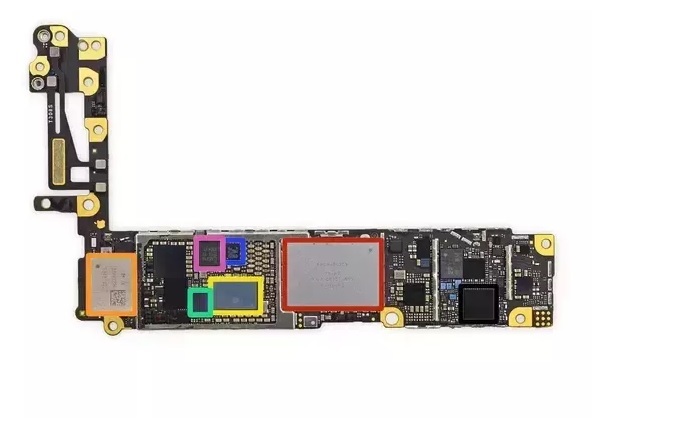 How to check logic board drain power problem? Is there a way to check it? Yes... that's our topic today. If you have an iPhone that having drain or consumed battery power fast. The first thing you suspect is the battery. Right? But what if the problem still exists after you replaced a new battery? Well, then you should send to us then we use some tools to check the voltage leak. Below method is how a PRO technician to do the diagnosis. If you would like to read instead of watching a video, then please continue to scroll down. 1. 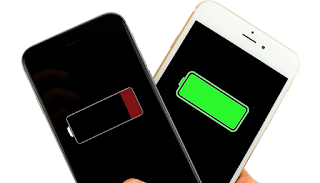 The first step we unplug your battery and then plug into Power Supply to read how much your iPhone is drawing power from it. 2. 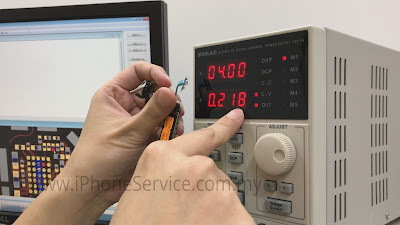 We must slowly to turn the knob that giving power voltage into the iPhone. 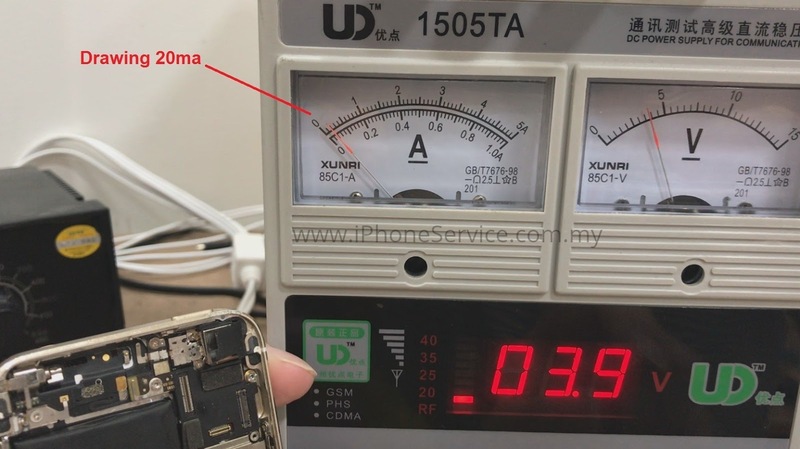 By carefully watching the Meter so that we can know is the iPhone draining the power before we turn it on. 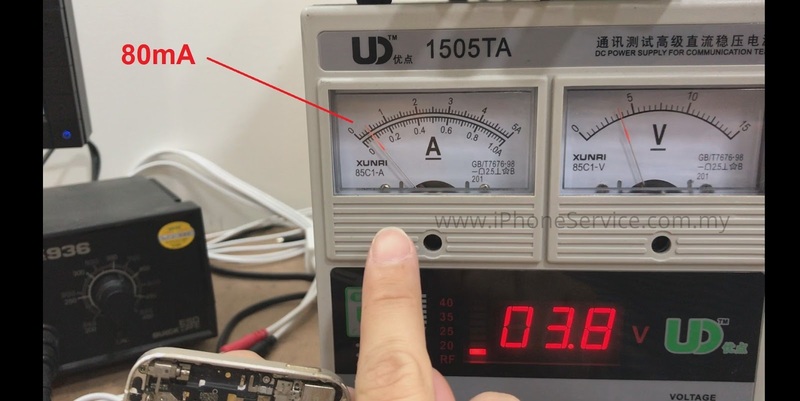 Slowly raise the voltage to 3.7 above which is battery level. It should be staying in ZERO and not drawing any power before we switch the iPhone ON. The left gauge is showing Amp unit. We set the reading to 1A. So it's 20ma leaking before we turn it on. 3. In this case, we found out this iPhone 5S is leaking power. Sure it's draining fast compare to normal iPhone. Even the owner switch it off, it is still consuming the battery fast. Can it be fixed? Yes, we can. But that's not today topic. 4. If the above case is not happening. Continue to check 2nd possibility by clicking BOOT UP TEST. We need to press the Power Button once. Not to turn it on. Just once. If you holding it more than a sec then it will turn on. But if we press it once, it will do a self-power boot up test. A normal iPhone would raise from 0 into 80mA then drop back into 0 positions. This is what we called the Boot-Up Test. 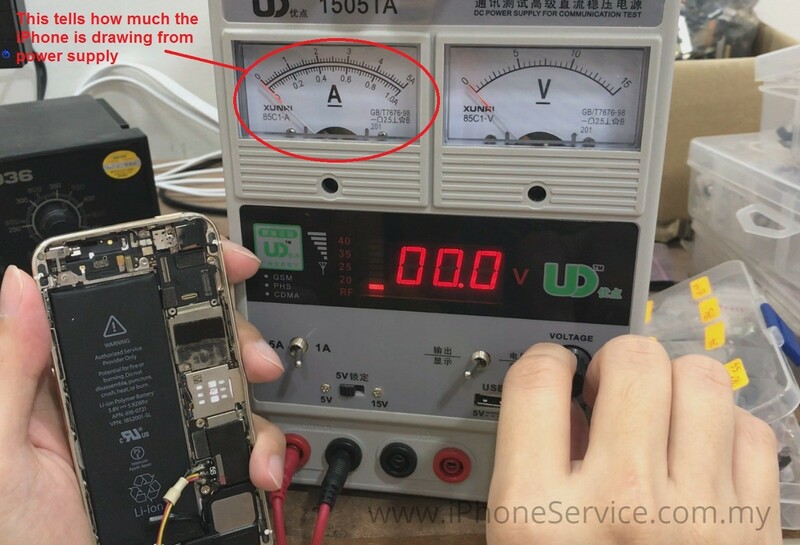 If the device passed the first test, then Boot-up-test can tell any major component or IC is drawing more power than usual. A charging IC problem can be easily found by this method. Another day topic too. This is a digital power supply. The function is the same. It can be more accurate for some purpose. 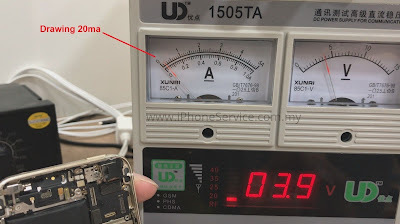 As you can see the photo above, this iPhone 7 booting-test at 218ma which is very high and indicated there is IC or circuit leaking power. A full power running iPhone is 1A = 1000ma. But it only require consuming 1A if the CPU is running at full speed. So far no app constantly running full speed. 1A full speed is just few seconds for loading. By the way, this iPhone boot-up test result started at 200ma. Means it's before power on or entering iOS, it's already consuming 200mA non-stop. I believe this iPhone 7 needs to charge twice in half day on normal use. Can it be fixed? Sure if we repair it first hand, then it will be a quick JOB which usually done within a few hours. Why? Because we received countless of failed repair iPhone from another shop. They mess up a lot of things which they shouldn't touch. They changed things without proper training/educated and even not knowing how to diagnosis the board circuit. 90% Done. Will add some TV and cabinet soon. My new logicboard repair station. And few more..
Our shop is going to renovation. Will be closed for one week. Estimate started on Tuesday 13 November 2018. Re-Open on 20 November 2018 and and continue business as usual. Day 1 - Installing glasses for noise cancelling. Shop is facing middle of the hall which is very noisy if event hosted. Especially they turn on music for stage. iPhone 7 and 7 Plus having audio or sound problem isn't rare. When Audio IC is not working properly. One of it or some of those.. Or you have all the symptoms above, it can be consider LAST stage of audio "cancer". In iPhone repair community, we called it iPhone 7 Audio IC Disease. 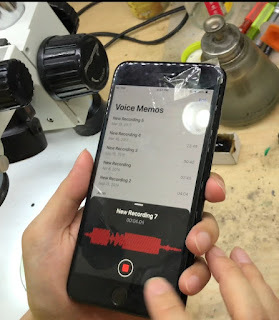 iOS 12 would show this message - Recording Failed. No Audio Device Found. We made a video and how to repair this issue. Answer: Drop it too hard, or bend.. One of the solder pad below the Audio chipset is broken. Not your fault. It's their design problem and they didn't expect it. Don't worry, it can be fixed permanently. "Advise: DO NOT send to normal shop repair this issue. 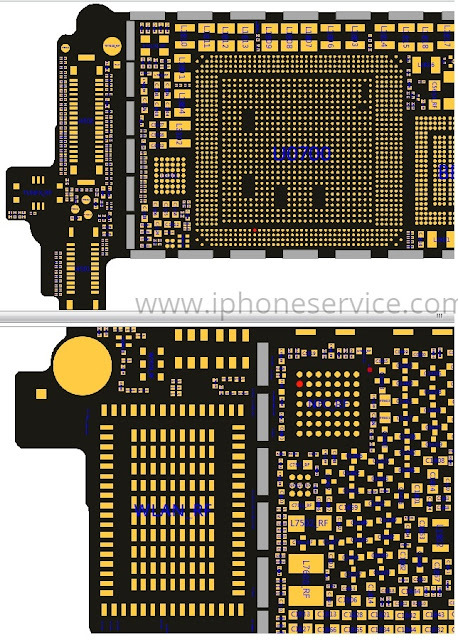 The audio ic is located behind Baseband and CPU. You don't want the they ended up to tell you now got another problem or became a brick which totally unable to POWER ON. Of so many cases that i repaired their failed attempted job. They "accidentally" overheated the components around. They either caused the iPhone became No Service (Baseband shorted) or unable to power on (CPU shorted). Ended up at higher cost repair and time wasted." This photo is an iPhone 7 Plus. The smaller iPhone 7 also has same flaw. 99% of audio disease is because of this pad broken. Even it's not missing, we MUST still need to build new track for it. I saw a lot technician didn't rebuild this track and the customer keep coming back with same problem. Technical term of this method is called "jumper". This is very important line that would cause totally malfunction of audio codec. It controls microphone, and sound codec. You might still have ringtone working but no sound when calling. We still can see the green PCB glue on that area after repaired. If this iPhone suffer seriously fall damage again, it would still working fine. The screen should be broken first before this problem reoccur. Don't worry. The solution we have for you is permanent fixed method. We'll cover you this problem for 1 year if it happens again. "Having the tools to repair doesn't mean also having precise surgical skill and experience." It can be done in 2 to 4 hours between. Make appointment with us. Countless people asking me how much is the motherboard..
"Apple center told me my motherboard is spoiled, it's beyond repair. Need pay them Rm12xx to replace whole device. Ridiculous!" Before you buy the motherboard.. Please send the device to my shop and i check for you is it can be repairable. 90% of motherboard problem are can be repaired. Example: A motherboard is RM 650. Motherboard repair price between RM 200 to RM 400. A second hand of whole iPhone is RM 750. We always quote you a fair price that lower than a board replacement... and much hell cheaper than Apple Center offer you device replacement at ridiculous price!! "By the way, technically it's called Logic Board. Not motherboard. Motherboard is in the PC which you can plug in third party hardware. Logic Board on other hand, you cannot. Plug in their designed hardware only." So today topic is iPhone 6 that is stuck in Recovery Mode. It failed to restore and show Error 9 in iTunes. Customer been to some shops telling them same story that it can't be repair. Let me show you how is the professional repair it.... in my shop, of course. Restore failed. A code appear. it's Error 9. No matter how many PC or Mac you use to restore it.. it ended up with same error. Error 9 is indicated NAND or NAND circuit failure. NAND is the memory chip. Some people like to say HDD or Hard Disk. But in Apple schematic, they called it NAND. We notice first bad news is "all the memory data inside" probably gone. Especially customer attempted to restore it and it failed. You don't want after we repaired the board and turn on found another problem then paying more.. Right? Then call customer and quote him a price after we inspect the board damaged under the MICROSCOPE. That's how professional checking procedure. Not Genius Bar that just telling you the Logicboard is spoiled and you pay whole device price. They don't even know what's wrong is the logicboard and which chipset or what circuit failed. They sure didn't check every parts of the device. Apple trained them nothing in repairing except follow procedure of reading script to tell you what to pay. I found the NAND is the only issue instead of CPU. So by replace it can solve the problem. Obviously this iPhone housing and LCD changed at other place before..
We use special tool that can read/write NAND. This tool is not cheap. Cost one thousand above and it just only works for specific models. Not every iPhone. The iPhone won't be able to activate if we don't do this. 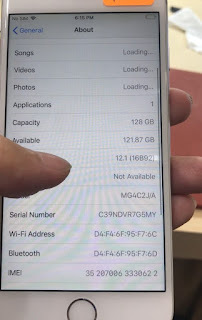 Activate process is needed go through Apple Server and they will verify the device Serial Number, Wifi and Bluetooth address. We also need to purchase the INFO of this device to reprogram it. It might take days to wait from server provide us the report of this iPhone. I must need to blackmarked all the infomation.. Who knows Apple might saw this and blacklist this iphone from server.. So the user might ended up unable to activate or network blocked. Once re-program done. Soldered the NAND back on the logicboard. All this kind of works require real professional repairer and tools. Special training already cost more than 20k. Tools cost above 20k and still need purchase tools for coming iPhone..
That is why it's not available at Face 2 Face or whatever Food Truck and Van on-site service. Those are DIY repairer. Plug and play stuff only..
Visit real professional to do the board repair directly. Not pass over to some guy and wait for weeks. 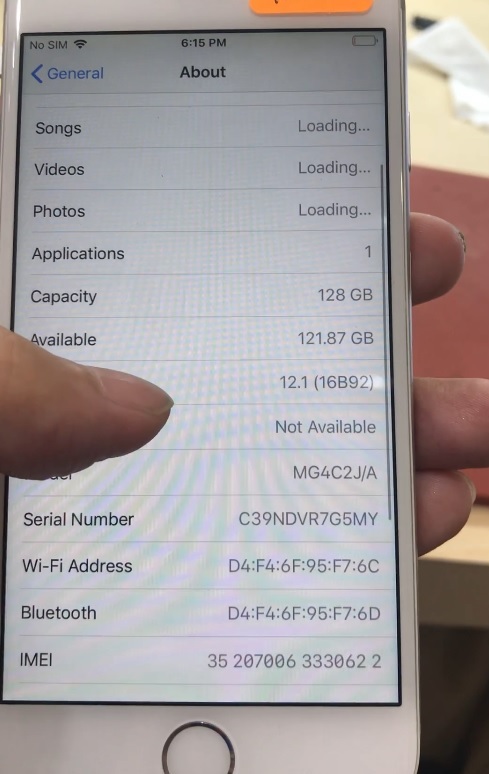 Do you still have 16 GB iPhone? You can consider upgrade your memory without buying new iPhone..
Today we done another iPhone 6 Plus.. i really can't imagine how 16GB is torturing user.. There is a saying in China.. an iPhone 16 GB is just beggar version of iPhone. Question: After upgraded the storage, can i still upgrade the iOS? Answer: Yes, it can. From iPhone 5 to iPhone X, so far none have problem. Apple doesn't check or care the capacity of your device. But their server will check the Serial Number, IMEI to make sure it's their product. Question: What if my device got problem later? Answer: There will be one month warranty for it. But warranty doesn't cover problem like LCD screen, buttons or camera. Question: If you so confident it won't get any problem, then why not you provide longer time warranty? Answer: Because we never know how user use their iPhone. Not confident on how they take care their iPhone. They can even kill the iPhone with wrong charger also. That's why we will check all function and inspect the board before proceed, so that we can eliminate potential problem too. 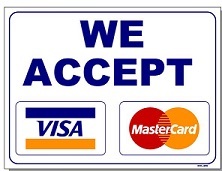 Question: Do you have price listed in web site? Answer: Yes, please scroll down to lowest of this page. By the way the price is up and down floating according market. Just like the computer HDD, their price are also not fixed. Sometimes go up or down. Answer: It's between 2 to 4 hours if appointment made. Otherwise it would just need one day. Question: Do i need to backup? Answer: Yes. We will need to erase/format the iPhone. By the way we can do the backup for you, but the process might extend another two hours or more. So it's the best you backup into your PC before you come. Question: Do i need to turn off iCloud or password? Answer: Yes. After re-format with new memory. Activation will require the previous ID if it doesn't turn off iCloud before. Question: How is it possible? Because Apple doesn't even have this kind of service. 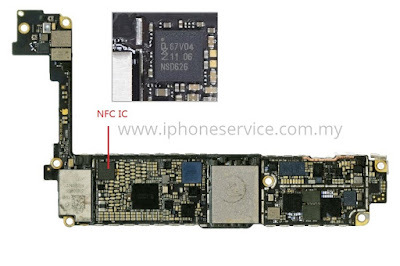 Those memory chip are called NAND. NAND supplier sure have their own developer tools and software. We purchased and use their tool that even Apple center doesn't have. We have multiple NAND writer for different models. Not just only one. iPhone X upgrade price click here! Apple Center can't do logic board / motherboard repair. They offered replacement unit but you will lost all the data memory. What if your iPhone has important data that need to be save? That's my job to solve the problem that Apple couldn't. I CAN SAVE YOUR DATA !! Have you ever see this? By the way this is not photoshop! Answer: Simple.. I just repair whatever ic / component on the board that is damaged. Question: But i was told the board is very broken condition. They said it's not possible. Answer: They don't have the right tool and the skill. I even bet they don't know people like me is exist. By the way, my last solution is move your memory ic chip into other new board. Answer: Cheaper than Apple Center. The price range is very rough and broad. You need send the device to my shop to check it. As the the board is not broken become pieces, we still can save the memory. Even from serious water damaged or rusty condition. 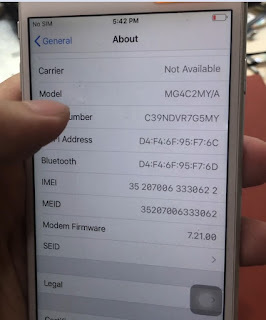 We can unlock the network / SIM / carried locked iPhone that came from other countries. After unlocked so that you can use any SIM card / Network carrier. Any iPhone. Included iPhone XS Max. Any iOS. No turbo SIM or R-SIM needed to use the SIM. Below first video is before we unlock. Second video is the same iPhone we unlocked. We managed clear our last battery stock. From Price RM 129 drop to RM 125. 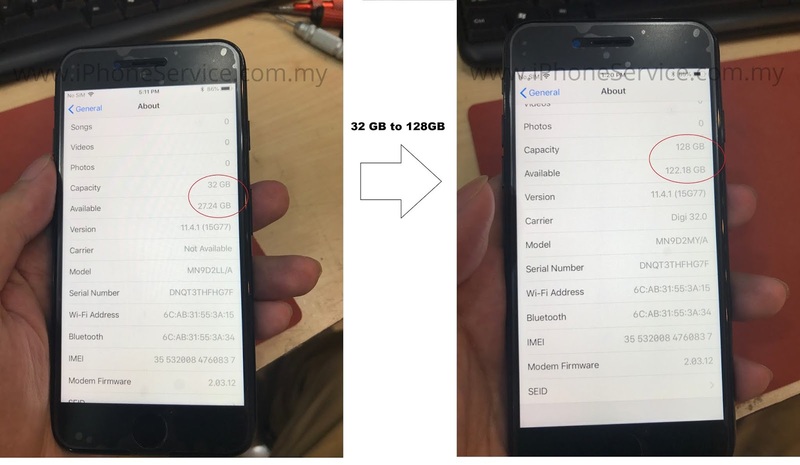 Last year was RM 350, Apple dropped the price so much because of the big case complain which found out they purposely lower our iPhone processor speed at each new iOS update, their reason do so that old battery can last few more hours usage and longer life span. But people don't want slow iPhone. So they apologized with battery cut down price and won't downgrade the iPhone speed on latest iOS. Hurry to take the offer before Apple close the offer! Many people didn't know that their iPhone storage can be upgrade. Apple shop sure tell you it's not possible. Of course they can't. They are just re-seller. The more you buy the whole product, the more they earn. So they won't bother doing small repair or small parts changing. They just know follow the script and tell you to pay more.. But our shop CAN do it! Just today we done upgrade an iPhone 7 32GB to 128GB. No need replace whole device. We are true specialist repairer can change the memory chip inside. Guarantee job and warranty provided. Want to upgrade your storage capacity? No problem! Let us know what model of your iPhone or iPad we reply you with price with option of capacity. Make appointment with us then we can done in few hours or less. Same day collection! Backup your data into computer first. The iPhone will need to Format/Restore after we done. As long the payment is done into our company account, we ship out the parcel as soon as possible. Thank you, for all the customer who always trusting us by sending their device through courier service. Because even for me, i also don't have much confidence to send expensive stuff to people that i never met before. Few iPhone 7 and 7 Plus came in last week. Customer said the iPhone was working fine before, but problem appear when he tried to restore/update in iTunes. The iTunes is showing Error 56 and the iPhone stuck in Recovery Mode. No matter how many times restore or use third part program to restore it, it's still the same. Restore progress bar stop at there.. According our PRO level training, iPhone 6S and 7 that showing error 56 is NFC chipset ic issue. Without proper training and Apple high level technical support, you only know what google tell you. NOTE for people who lazy to search google: NFC stands for “Near Field Communication”. One of type Short-range wireless connectivity. Apple Pay that working like Smart Tag or Visa Wave. By the way, before we quote a price, we need customer to leave the iPhone check for one or two days. Because by experience we know it won't be so simple job that just to replace the IC and then problem solved. Normally this kind of IC won't fail itself.. So we need to take our time to check the board carefully. First we take out the board. Measure the lines between the power to NFC IC. Job will be more complicated if all Voltage are correct and nothing short. After we found nothing wrong then continue to remove this IC and measure all the pads below. See the Red Dots? 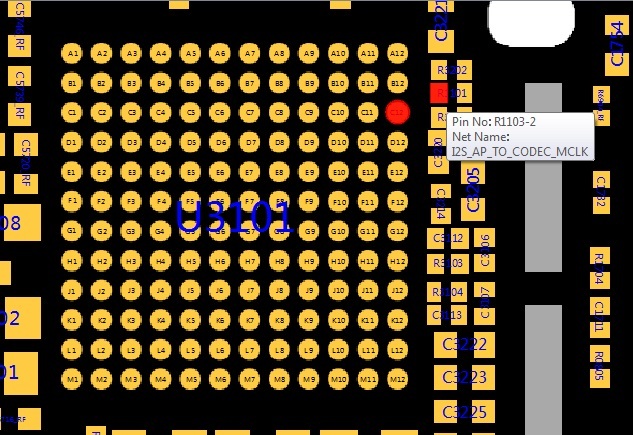 Mean that dot at NFC is connected to front of board that under the CPU. OMG !! Two of the NFC pads which directly goes into CPU. B1 and C1 legs has no connection into CPU. So the price we quote customer will be high since this is the job is involving the CPU. If customer OK then we proceed to remove the CPU. CPU job must be expensive. You see the big A10? It's the CPU, it's big enough and might create other problem if something around it goes wrong. Because we will bear ANY other problem that happened after we rebuilt the CPU. This kind of motherboard repair is PRO level. So far now in Malaysia, you won't see our kind of expert people around in handphone shop or shopping center. that including Low Yat Plaza. Checked the tracks between NFC and CPU. It's OK. Means by only reball / rebuild the CPU then will be OK.
DO NOT send to person who doesn't seems to know how to repair. Any amateur try to practice repair the CPU usually end up totally death. So even you know what is the error problem, you never know what we going through to complete the repair. Sometime it's easy, sometime it's NOT.